Jihad Watch : Concrete bollards, bag checks and vehicle blockers — why is all this necessary? Because of the possibility that some Muslims might try to carry out a jihad massacre. But don’t Sydney authorities know that it’s a Religion of Peace and only greasy Islamophobes think otherwise? How dare they suggest that there is a problem with jihad terrorism — even as, of course, they refuse to name it or identify the source of the threat in any way? They need “Islamophobia” reeducation, pronto. Beefed up security measures including crowd control, bag checks and new vehicle blockers will be deployed across Sydney for this year’s Anzac Day commemorations. Tens of thousands of people are expected to attend Anzac Day events across the city on Wednesday, with NSW Counter Terrorism Minister David Elliott saying there is no specific threat and the measures are in place to ensure the community felt safe. 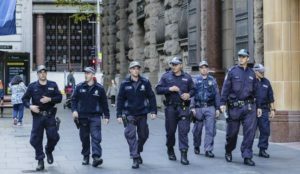 ‘The Anzac Day march covers a significant part of the Sydney CBD attracting thousands of people and increased security measures need to be in place to ensure the safety of both marchers and spectators,’ he said in a statement on Sunday. The new vehicle blockers are being trialled for major events like Anzac Day and at other locations across Sydney’s CBD as part of the NSW government’s commitment to public protection, Mr Elliott says. Crowds attending Anzac Day events in the city are being told to plan their trip and allow extra time for bag checks….